On March 24 Wahunsenakah Lodge 333 held their 2012 Lodge Leadership Development Course (LLDC) at the McGrew Towers Conference Center at Hampton University. To commemorate the event the Lodge issued an oval event patch styled to match their series of 2012 activity emblems. The patch features the Emancipation Oak which stands near the entrance of Hampton University. It as was the site of the first Southern reading of President Lincoln’s Emancipation Proclamation. Thanks to George Homewood and Larry Johnson for the patch picture. Wahunsenakah Lodge 333 held their annual Winter Service Weekend at Bayport Scout Reservation from Feb. 24-26, and issued a beautiful oval emblem for the event. With a design very similar to their 2012 SR-7A Conclave flap, the patch pictures the historic Battle of Hampton Roads, also known as the Battle of Monitor and Merrimack. 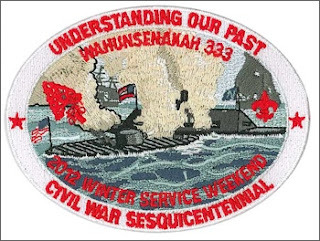 The design of Wahunsenakah's activity emblems for the remaining events in 2012 will continue the theme with each following the same oval design with white background and red lettering. 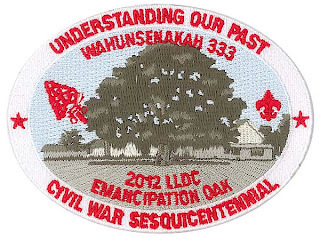 "Understanding our Past" will appear across the top and "Civil War Sesquicentennial" across the bottom of each patch, with the central design changing to recognize events at other prominent locations in the area served by the Council and Lodge. Be sure to watch this site to see them as they are issued, and check the Wahunsenakah Lodge Activity Emblems page to view every event patch issued during the 15 year history of Lodge 333.